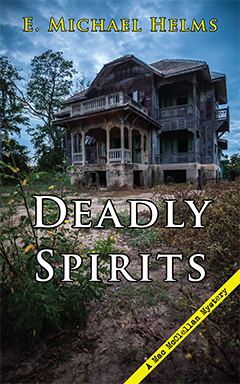 Synopsis: When PI Mac McClellan’s girlfriend convinces him to join the Palmetto Paranormal Society, he becomes embroiled in a case of whooodunnit. The society president, while investigating an old hotel, is found dead at the foot of the stairwell, his neck broken. The man’s secretary and current squeeze stands horrified beside his body. Authorities rule the death an accident. Mac has doubts—no one heard the man tumbling down the stairs. Then the secretary dies in an apparent suicide. Two deaths in two paranormal investigations, and not a peep out of either victim. Mac suspects there’s more going on than a vengeful spirit. Book 4 in the Mac McClellan Mystery series, which began with Deadly Catch. Reads as a stand alone. Elmore Leonard, the author of this quote, is an American novelist, short story writer, and screenwriter. His career boomed in the 1950s with his Westerns and continued to grow as he branched out into crime fiction and suspense thrillers. His most well-known pieces are “Get Shorty,” “Out of Sight,” “Hombre,” “3:10 to Yuma,” and “Justified.” Known and commended by critics for his strong dialogue and interesting use of grammar, Leonard never let the mechanics of writing get in his way.